Faron Young--the Singing Sheriff--recorded country songs and entertained for more than forty years. His hits included Goin' Steady, Sweet Dreams, Hello Walls, Alone With You, It's Four In the Morning, and Live Fast, Love Hard, Die Young. The Country Deputies backed him from 1954 until his death in 1996. When Faron completed his Army service and returned to Nashville in late 1954, fiddler Gordon Terry became the first member of his band. Joe Vincent on steel guitar and Tom Pritchard on bass also joined him. The Wilburn Brothers played lead and rhythm guitar and fronted the show, until embarking on their highly successful recording career. To get a name for the band, Faron's manager Hubert Long held a contest. Gordon Terry left the band in 1956 after obtaining a recording contract. Joe Vincent followed in 1957, to pursue a career as a respiratory technician. Both are now retired and living in the Nashville area. Tom Pritchard died in 1981. Deputies in the late Fifties were drummer Roger Miller (years before King Of the Road), steel player Ben Keith, Odell Martin on lead guitar and frontman Darrell McCall on bass. Darrell replaced Donnie Young, who later became famous as Johnny Paycheck. The Country Deputies spanned five decades, with approximately fifty musicians wearing that title. They considered themselves the "roaringest" band on the road, and took pride in causing other bands to be fired for attempting to keep up with them. 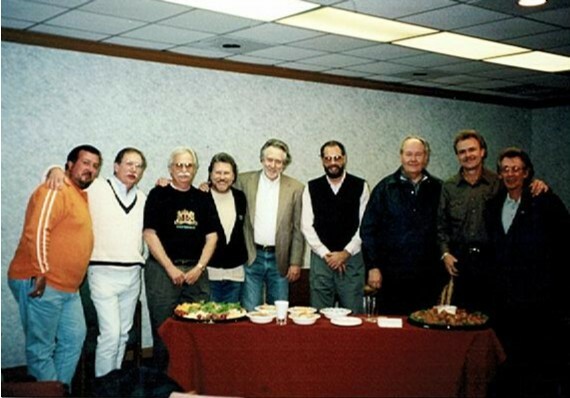 A group of these former Deputies met recently in Nashville to reminisce about the Singing Sheriff and days on the road. "Do you remember" stories flew for three hours. The stories begin with Darrell McCall describing a show date at the State Line Club in Idaho. In the days before band buses, they traveled in a station wagon that pulled a trailer containing band equipment and uniforms. The Deputies earned $25 per show and did not get paid for travel days. Faron covered their hotel rooms and clothes, but not meals. On this date they had driven a long distance, with no money for food, and arrived in time to do the show. When they finished, the owner treated them all to a steak dinner. They had just sat down at the table, and cut into steaks "as big as Bill Monroe's mandolin case," when a fan asked Faron for an autograph. Faron refused, and the man accused him of being rude. That was too much for Faron, who slid back his chair, grabbed the guy, and knocked him across the table. Steaks flew everywhere. Law enforcement officers arrived to put the Sheriff and his Deputies in their car. They were escorted out of town, still hungry. Faron had a reputation for caring about his fans. He always visited with them after a show and signed autographs until the last in line had been satisfied. Just don't bother him during a meal. Jerry "Cootie" Hunley holds the Deputy longevity record, with 27 years as Faron's drummer. He remembers one late-Seventies night when they stopped the bus to get some food. Faron asked Cootie to bring him an egg sandwich. Cootie happened to be dressed only in a cape and his underwear, with a mask made of womens bikinis. As he and the other Deputies waited for their orders, a restaurant patron objected to their noisy behavior, and a fight began. Cootie threw a newspaper vending machine at his antagonist, and a table came back at him. Fans who had attended the concert watched from a safe distance and cheered for the Deputies. Cootie headed for the bus upon being told the cops were coming. No one remembers whether Faron got his egg sandwich. These musicians consider Faron Young an all-time great showman and entertainer. They respected his talent and felt privileged to work with him. They also never got bored. At a concert in San Antonio, Faron crawled inside a grand piano. Everyone in the house could hear him cussing when Darrell closed the lid. Steel player Skip Jackson describes Faron's "Tell it like it is" segment during the Vietnam era: "It was all off the top of his head. We would play [a hymn] as background for his speech. Every night it was different. You couldn't hardly play, listening to what he was saying. He was entertaining us as much as he was them. It was just as exciting for every one of us." Stu Basore, the last Deputy steel player, adds, "When he was right, what a joy to play with him. Faron was magic." Faron's alcoholism was an ever-present problem, and he was often far from "right." When he got into a "mean drunk," the Deputies tried to make him laugh to bring him out of it. Darrell and Cootie devised a puppet show to entertain him, and he enjoyed it so much he wouldn't let them stop. Steel player Al Lewis broke a mean-drunk mood one night--after Faron had fired most of the band--by sitting on Faron's lap and singing to him. Once the Sheriff started laughing, he restored everyone's jobs. The conversation moves to Faron's generosity. He would hand a complete stranger five hundred dollars and say, "Here, go get your teeth fixed. You'd be a pretty girl if you had pretty teeth." One Deputy comments, "But he wouldn't give us a five dollar raise. That's the kind of fellow he was. He was generous to everybody but the band." Skip Jackson reminds everyone, "We loved that man. That's why we experienced everything we did. We liked it, or we wouldn't be there." Still, there were times that love and hate intermingled. Cootie adds, "You could hate him just as much as you loved him." Fiddle player Hank Singer says Faron got him started in the music business. "It was my very first job. I was only out of high school about three months. I give him credit for getting my career off the ground. He took a chance on a young guy that never had a professional job in his life." Darrell says, "When I went to work for him, I was fresh off the farm. I was so shy I couldn't look at the people in the crowd. I'd want to get behind my amp to play. But after the first two weeks with Faron, I could have worked the White House and looked the President right in the eye." Darrell remembers a show at a big auditorium in the Pacific Northwest. A sober Faron was at his entertainer best and the crowd loved him. Three oversized drunks started heckling him. He and the crowd tried to ignore them, but they continued. At one point Faron stopped the music. He thanked the crowd for being patient, and said, "If you really want a good show, wait till I finish my last song, cuz I'm fixin' to nail all three of them." Then he added, to the chagrin of the band, "If I can't, my band can." The heckling continued. Finally, Faron stopped in the middle of a song and vaulted off the stage. The bullies headed toward the back door, throwing insults as they went. Faron punched out two of them and the third escaped. The Country Deputies are unanimous in believing Faron Young should be in the Country Music Hall of Fame. Although his selection is years overdue, they still expect it to happen. Cootie speaks for them all when he says, "I just hope I live to see him go in it."